For king, country, or corporation, adventurers take up their sword and pistol and set sail into the void. The terraformed planets of the home system offer adventure and political intrigue aplenty, while the New Worlds hold fame and fortune for those bold enough to lay claim. Whether you are a treasure hunter exploring ancient ruins, a swashbuckling starship captain fighting pirates in the cold depths of space, or an alien mystic seeking to become one with the Light Eternal, your destiny will be forged in this crucible far from home. 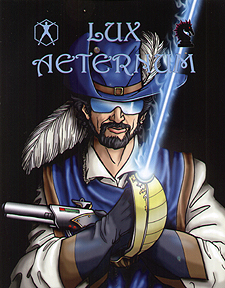 Lux Aeternum is a cinematic space opera setting with a huge diversity of cultures, locations, and opportunities for adventure. Humans from the cyber-dystopia of 22nd Century Earth are given a second chance - carried to a far off system where they can begin anew. Here they find other humans brought from Europe's great age of exploration. After developing along separate paths for centuries, the views of these fellow humans are now as alien as the non-human races already present. And something has gone terribly wrong. The benevolent elder race that formed this Eden has disappeared. As tensions mount and the Chosen gird for war, an ancient evil prepares for invasion. Swords and pulse guns, spells and cybertech, warhorses and spaceships - just about anything can be found in Nexus Sector where humans, aliens, and even sentient androids strive toward their disparate goals. The stakes are high - a lot to be lost, but even more to be gained. There is ample opportunity for the bold to take a stand and shape the future of humankind and her allies. Fame and fortune await, but turmoil and chaos loom. Shadows gather on the horizon. It will take true heroes to become paragons of the everlasting light and drive back the enveloping darkness.